There are some products that are simply good to have on hand. You'd be smart to add Porter's Lotion to your list of year-round essentials. 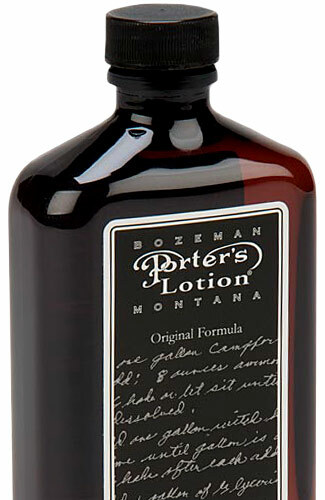 Created by Heber Porter, a Montana pharmacist in the early 1900s to treat dry skin, the formula has remained virtually unchanged and is still made in small batches here in America. More of a tonic than a cream, the liquid lotion combines the restorative and healing properties of such potent ingredients as camphor and witch hazel with natural elements like rosemary oil. Make no mistake, this makes for a medicinal smelling product, but the aroma dissipates as quickly as the lotion absorbs into the skin—which is almost instantly. Porter's isn't greasy or oily, and has a slight cooling effect on the skin, which makes it particularly soothing on sunburns, bug bites and razor burn. And come winter, it makes fast work of parched, cracked and flaky skin. In short, it's your secret skin weapon: use it anytime, anywhere and the old-timey flask bottle looks pretty cool too, don't you think? Years ago, when the business was about to go under, a devoted Porter's customer—who's family had used the lotion for four generations—bought the company.